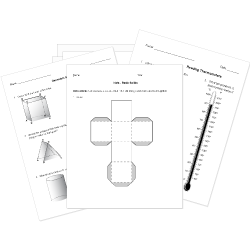 You can create printable tests and worksheets from these Grade 6 Area questions! Select one or more questions using the checkboxes above each question. Then click the add selected questions to a test button before moving to another page. [math]bar (BC)[/math] measures 12 m and [math]bar (AB)[/math] measures 4 m.
What is the area of right triangle ABD? Find the area of the right triangle shown. Side BA is 7.5 and side AC is 4. Find the area of the right triangle shown. Side AB has has a measure of 8 and side AC has a measure of 6. Use the following information to find the area of pentagon ABCDE. What is the area of this rectangle when the sides are 5 feet x 13.5 feet? Find the area of one of the right triangles. The height is 4 and AC is 9. Which formula finds the area of a triangle? What is the area of a triangle with base 2 and height 4? Find the area of the right triangle shown. Side AC is 8 and side BC is 15. Deraj wants to paint a rectangular wall in his townhouse. What measurement of the wall would be most valuable to him? 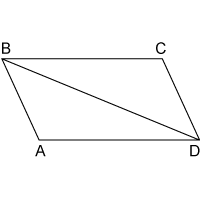 Which formula finds the area of a trapezoid? Sofia knitted a rectangular afghan that has an area of 24 square feet. If the length of the afghan is 2 yards, what is the width in feet? Which of the following describes a correct method of finding the area of a trapezoid? Compose a right triangle, find its area, then divide the area by 2. 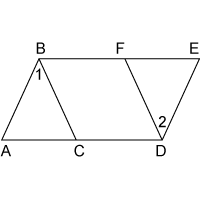 Compose a parallelogram, find its area, then divide the area by 2. Decompose into 2 right triangles, find the area of 1 triangle, then multiply the area by 2. Decompose into 2 parallelograms, find the area of 1 parallelogram, then multiply the area by 2. What is the area of a rectangle with length 4 and width 5? The area of square ABCD is 64 square units. What is the area of triangle ACD? Calculate the area of the trapezoid if [math]bar(AD)[/math] measures 10 cm, [math]bar(BC)[/math] measures 8 cm and the height is 5 cm. The length of [math]bar (AD[/math] is 12 units and the height of the parallelogram is 6 units. What is the area of triangle BCD? 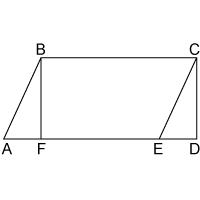 The height of parallelogram ABED is 7 inches. [math]bar(AC[/math] is 3 inches and [math]bar(AD[/math] is 12 inches. What is the area of parallelogram BCDF? Triangles ABF and ECD are congruent. If triangle ECD has an area of 15 square cm and trapezoid ABCD has an area of 80 square cm, what is the area of trapezoid FBCE? What is the area of a parallelogram with base 30 ft and height 25 ft?